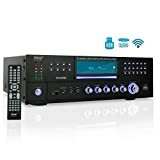 Easy to use onboard volume adjustment controls and additional AUX-in port for Apple , Samsung , Sony , HTC , Toshiba and more Smartphones , Tablets , MP3 Players , TV's , Computers & more. 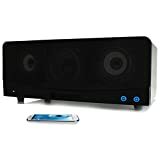 Powerful 35-watt RMS 2.1 channel speaker system with 70-Watt Peak features SonusMAX enhanced drivers and subwoofer to deliverroom-filling sound & powerful, booming bass. easily pairs with A2DP equipped audio devices. 3 YEAR WARRANTY GUARANTEED! 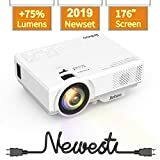 9.48 lbsMakes the perfect bookshelf speaker or wireless audio entertainment system for watching movies or listening to music on Netflix, Hulu , Pandora , iHeartRadio , SoundCloud , Spotify , Amazon Cloud Collection, Slacker Radio, GrooveShark and More ! The BlueSync's modern design & high-fidelity sound compliment any room while equipping it with stunning audio! The 35-Watt 2.1 Channel system features SonusMAX Technology and a powerful subwoofer to deliver sweeping highs and full, deep lows. 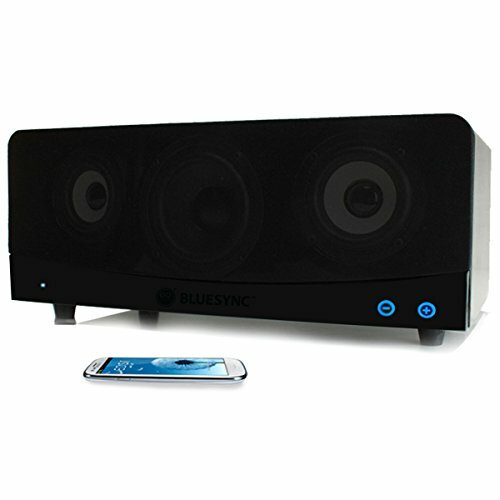 Whether you want booming bass while entertaining guests or room-filling sound while relaxing at home, the BlueSYNC is the speaker for you! Sync in just seconds and Bluetooth 2.0 allows you to stream audio from your device to the BlueSync from up to 30 feet away. The BlueSync also supports non-Bluetooth audio devices with the included 3.5mm audio cable & AUX line-in port.